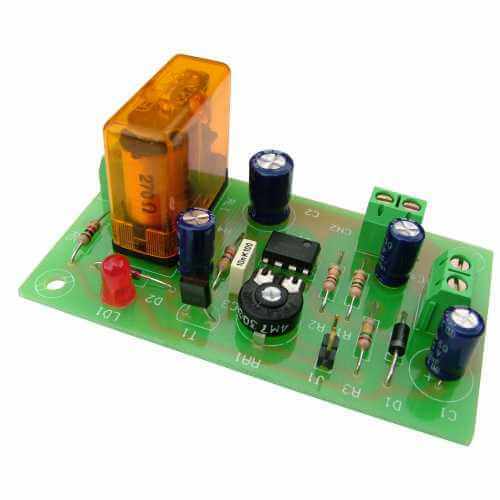 1 to 180 second re-triggerable delay timer module with a mains rated relay output. Timer is activated via the Start Input (using for example a push button or relay contact closure). On activation the relay turns on for the user-set delay time period. Any further triggers received while the timer is active will restore the full delay time (non-cumulative) without interrupting the relay. If no new triggers are received before the delay timeout is reached, the relay will turn off and the board reset ready for a new trigger signal. The delay period is adjustable from 1 to 180 seconds using the onboard potentiometers (header pins allow the use of user-supplied external potentiometers if required).